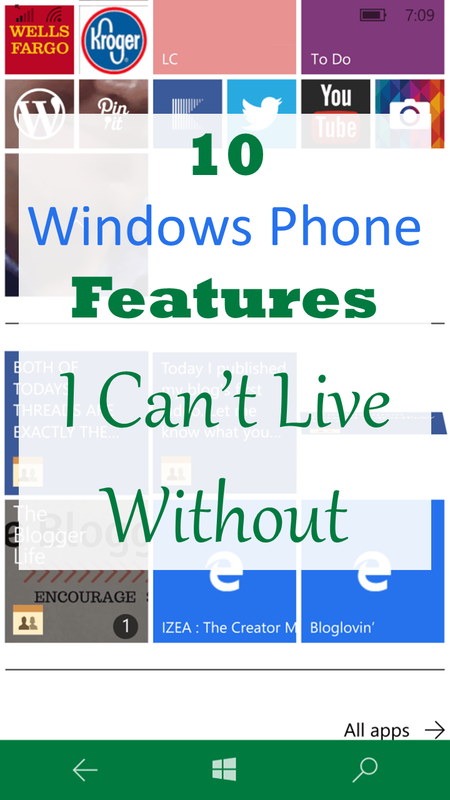 10 Windows Phone Features I Can’t Live Without! When I first heard about Windows Phones, I was so excited to see what they were all about. So, as soon as my first upgrade came, I switched from Android to Windows. Almost instantly, I fell in love with the platform and couldn’t wait for all of the new features to come. The most anticipated upgrade for me was the upgrade from Windows 8 to Windows 8.1. I could not wait for Cortana and even downloaded the preview version for developers so I could put it to use before hitting the market. Well, recently, I was up for upgrade again and decided to try to use an Android again for the sole purpose of cutting cists. I was trying to get off of monthly payments because I felt like payments were consuming my life. After only three months with my new Android phone, I had had enough and decided the payments weren’t bad after all and that I should get myself a new Windows Phone. So, now I have the new Microsoft Lumia 950 running Windows 10. When I switched to android, I realized that Windows Phones had quite a few features that I just couldn’t live without because they had been a part of my day to day phone experience. Below are my ten favorite features. Live Tiles – Not only can i see which apps have notifications from my glance and lock screen, the app tiles are live and show how many notifications are outstanding. The added bonus to this feature is that the tiles rotate through each notification with a short description so you can know what the notifications are before even opening the app. Camera Button – Since the creation of cameras, there’s been the idea of Point and Shoot. This offers familiarity, nostalgia, and simplicity to the photo taking process. Windows has made sure to include this button on their phones to help save time and bring back this known feature. This feature is very beneficial and also helps to keep the phone steady and avoid blurred images. Syncing between devices – Windows is an all-encompassing experience. If you have a Windows phone, tablet, or computer, all of your data can easily be easily accessed from any device at any time. You can just pick up right where you left off! And, the mobile apps are just as friendly as the desktop programs! Tile Picture Background – This is one of my favorite useless features of this phone. I always have a photo I love as the background of my phone/desktop/etc, but with other phones, I have to cover the photo with the apps. With Windows, the photo becomes the tiles and a white ‘grout’ type section separates the tiles. The lines make it easy to tell one tile from another without taking away from the photo. Folders – Folders are something new that have come to the Windows phones. Androids have had folders for quite some time, but I just never liked the way they opened or were able to be used. The Windows folders on the other hand are very perfect. Each tile that is inside the folder can still perform live updates while in the folder and when the file is opened, the tiles neatly add a row and then close back up when the folder is closed. This is very helpful for putting similar items together or saving room on the screen. Glance Screen –The glance screen was the feature I missed the most. Being able to look at the phone to see how many notifications I have and which apps the notifications are for us a huge convenience. Not to mention, there is a night mode so the text color can be changed. I prefer white font during the day because it’s bright and red font at night because it’s not as harsh. There were a few apps that tried to act like the Windows glance screen on the Android platform, but ultimately, none of them even compared. Pinning tiles – Can’t find the app you’re looking for? No problem, just find the mobile webpage and pin it! Or, pin your favorite contact or a Facebook group. There is so many different things you can pin. The experience is extremely customizable. Driving Mode – Ok. This one I really really hated living without. Driving mode to me is not only for myself but for everyone I know. When I am using driving mode, the phone will not let me know I have a text message. Instead, it will text the person who texted me to tell them I’m driving and it will hold the notification until I look at the phone (which won’t be until I arrive because I don’t know there’s anything waiting for me). So, my friends are taken care of with the text back and then I’m taken care of because without the notification, there is no temptation to see what the text says. I have Bluetooth in my car so I choose to allow phone calls to come through while driving, but you can easily turn these off during driving mode as well. Android had a few apps that claimed to be this feature, but once again, none of them compared. Hey Cortana! – Cortana was my most anticipated feature at the Windows 8 to 8.1 upgrade. I was so excited about this feature that I downloaded to preview version so I would be able to use it before the official version was released. My favorite way to use Cortana is to tell her to remind me of something either at a certain time, certain place, or when I talk to someone. She can also track packages, routes, and much more. My new favorite thing to do with Cortana is to say ‘Hey Cortana, Smart Things – Goodnight’ and then she opens my Smart Things app and turns off all the lights in the house an makes sure my doors are closed and locked. Text From Computer – Ever since texting, I’ve wondered why you can’t just text from your computer. Of course, computers have instant messages but when I’m typing on the computer and I get a text message, it’s a pain to have to switch keyboards. But, I’ve heard recently that Windows is going to be syncing the calls and texts so you can reply from Cortana. Yes! I have used accounts such as Text Now to be able to text from the computer but you can’t use your own phone number. Lastly, one thing I’m extremely excited about is the Lumia 950 doc to connect the phone to a monitor and use the full Windows 10 desktop experience. Now at this point, I already have a computer hooked up to the tv, a laptop, a tablet, and my phone so I’m not quite sure what good this doc would do me but when it’s time to get a new computer, I may just consider downsizing to the doc. All these features sound really great. I don’t think I can ever shift from Android though! My boyfriend is the same way. I’ve switched from Android twice and wondered each time why I didn’t switch sooner! I can’t imagine making the switch to a Windows phone, but I know lots of people that swear by them! This is really great information. I might have to look into switching when I am able to change phones again. I’d say it’s definitely worth it! My favorite phones have been the HTC 8x and the Microsoft Lumia 950. I also had the Nokia 920 but I’m not the biggest Nokia fan. I loved reading this because I have been an iPhone girl from the very beginning and it’s so fascinating to hear about all of the features on a Windows phone! I have to admit: I’ve never understood the need to text from a computer until recently, and I’m learning that it’s a cool and helpful feature! Thanks for sharing all of these. Yes it is awesome. I left my phone at my parents house the other day and they wanted me to text them when I got home. Luckily I was able to do that from my computer! I don’t have a Windows Phone (just can’t give up my Android apps! ), but I recently got a Windows tablet and I LOVE IT. I’ve been using Win10 for about half a year now (cautiously slow adopter) but it’s amazing. I love having apps on my computer, and the tablet is like having a mini laptop. So freeing! It’s so nice to have all three linked. I’ve found that there are options for most of the apps that I liked on Android. I really like that a lot of the apps can sync across all devices. I can also just project my phone up to the tv and use it like a computer. I heard they are working on a new phone type thing that focuses more on being a computer than a phone which is pretty cool!